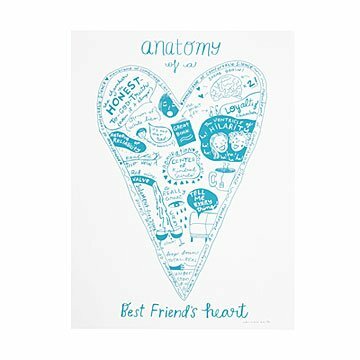 Celebrating the full picture of BFF life, this screen print features Sandra Dumais' playful heart illustration that offers a refreshingly honest look into cohort-ism. Sandra hand sketches, paints, and digitally draws a narrative interplay of words and images. The result is an ode to hilarity, kindred spirits, and weird haircuts that makes for a positively charming character study. Handmade in Montreal. Perfect gift for the perfect person! This gift is a special treat for the best friend in your life. Quite clever and frames beautifully.